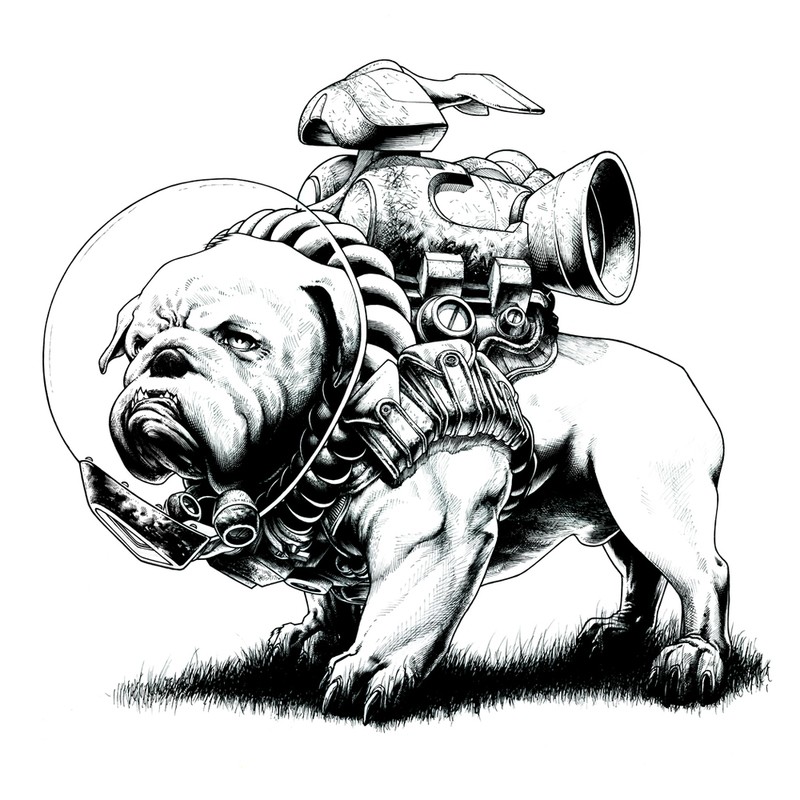 This project, well it all started with the Bulldog and I had just intended it to be a single illustration. I went to the New York Comic-Con and, not really having much to sell, I made a few Jetpack Bulldog prints to bring along. I sold out of them on the first day and people started asking me if I had other types of dogs. I started keeping a list of the types of dogs that were requested most. By the end of the first day I was doing a few quick ones as commissions. I took some larger orders home for delivery later. The process is a fun one. People will send me a couple pictures of their dog and I'll choose a few that give me enough reference. I basically do a pencil portrait of the dog first, scan it in, and print it out small and light on several sheets of paper. I sketch a few jetpacks on them to find the right one that reflects the dog's personality. 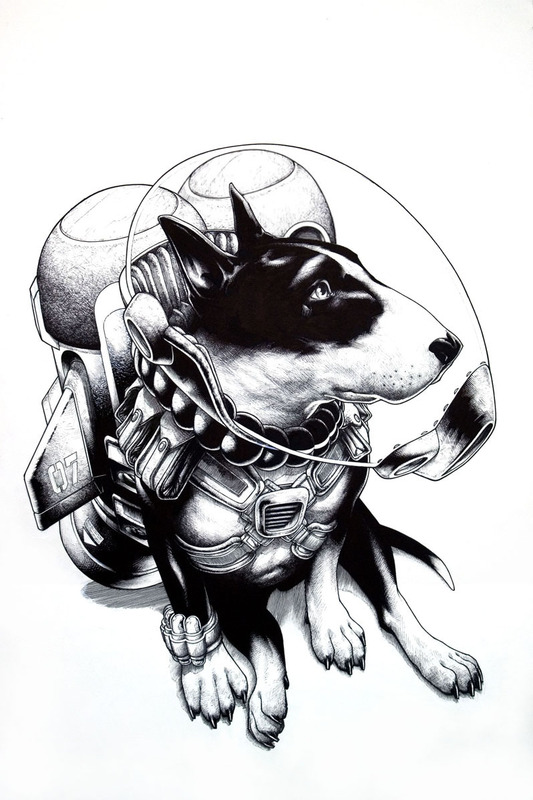 Once I have the dog and the jetpack all penciled out, I'll lightbox them onto a large piece of Bristol to produce a very cleanly inked final. The finals are usually around 25 x 25 inches. This dog was from Argentina, his name was Lionel Richie. This pencil is of Mickey. He was interesting to draw because he had a crazy eye that had been through a few operations and an underbite. This is the final ink complete with a Mickey Mouse decal on the wing. It was a last minute request from the buyer representing his namesake. These are the pencils for Mona, a beautiful brindle rescue Greyhound. This is a great example of the design process of the jetpack; a pencil of just the shapes without any lighting. This piece was a request by a friend as a birthday present for his friend. He did not know the name of the dog so I called him Fluffernutter for the duration. Here is the jetpack design stage for Fluffernutter. I thought he needed a giant fishbowl-style space helmet. The client on Fluffernutter really liked the look of the pencil so the final was completed in pencil on a 25 x 25 inch sheet of Bristol. 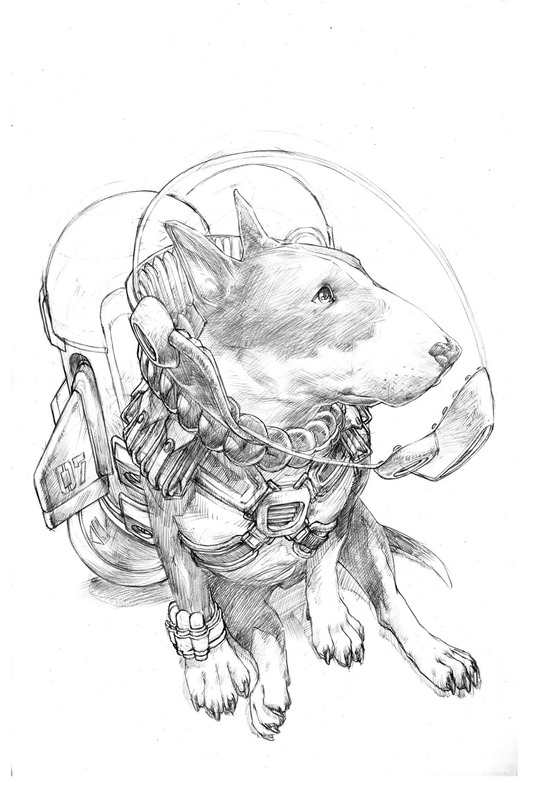 This is a quick sketch of Curtiss, an incredibly smart Bull Terrier I had the pleasure of taking care of for a long time.